As far as Derek Peterson sees it, Wall Street can't compete with the marijuana business. After a decade in investment banking, in late 2009, Peterson learned that a friend's marijuana dispensary was clearing $18 million a year, dwarfing Peterson's $300,000 to $400,000 annual salary at Morgan Stanley. "The place was the size of a Starbucks and had about 900 patients a day," said Peterson, now 38. "I was a finance guy, always analyzing different industries. I started looking at the products and services utilized in this industry, the economics behind it and how I could prosper from a peripheral business." Peterson launched GrowOp Technology in May 2010 as a side business, selling "plug and play" mobile hydroponic trailers equipped with everything necessary to grow medical marijuana. Morgan Stanley fired him seven months later for his pot side business -- unfairly, Peterson claims. He said saw many of his colleagues running side businesses. "Morgan Stanley Smith Barney believes it treated Mr. Peterson fairly and appropriately, including in its application of its well-established policy requiring disclosure and approval of outside business activities," a Morgan Stanley Smith Barney spokeswoman told The Huffington Post. Rather than joining another Wall Street firm, Peterson decided to get serious about weed. Through one of GrowOp's investors Peterson had the opportunity in February 2012 to merge with Terra Tech Corp., a publicly-traded firm that was getting out of the voice IP industry. Besides selling hydroponic trailers for $30,000 to $80,000, his company makes hydroponic equipment, acquiring smaller retailers and creating new technology, including an iPhone app that allows growers to monitor crops remotely. Terra Tech projects 2012 revenues of more than $1 million. HuffPost Small Business recently asked Peterson what it's like to go from Wall Street to weed. Were you anxious leaving Wall Street to enter such a risky industry? It was frightening. I had a billion second thoughts. I spent 10 years building up to where I was, and was walking away from periodic seven-figure bonuses, benefits, expense accounts and perks to run my own company, living off my savings. But I had a conversation with my family, and with my wife behind me, I jumped in and started kicking with both feet. What did your peers on Wall Street think? For the most part, everyone was excited. There was a lot of press at the time around the "green rush," so they understood there was a market opportunity, but I could tell they thought I was crazy for leaving the comfort of Wall Street. For me, it was more important to make some sort of impact, create some jobs and actually contribute to society in some small way. What Wall Street principles did you want to apply to the medical marijuana industry? I saw a fragmented industry and knew it was a good opportunity for mergers and acquisitions, for the consolidation of mom-and-pop shops that didn't have an exit strategy or ability to monetize. The first and simplest concept I brought was economies of scale. You've got a thousand different retailers all buying at standard price, so by forming a buying group, you could compete for better pricing. We're going for complete vertical integration, to try to amalgamate the industry. Was it difficult to break into a business in which the players weren't necessarily familiar with these principles? It's a cultural industry in which people are congealed by loyalty and don't want outsiders coming in and shaking things up too much. We found it was easier for us to present the opportunity to bigger chains that had business acumen. Besides the inside adjustments, do you feel the outside pressure of being in a controversial industry? I never wanted to get involved with the plant directly, because of state and federal laws. If we owned a dispensary, that would be a different ballgame, but we do a good job of keeping it at arm's length. We sell hydroponic equipment to cultivate products, whether that's food or cannabis, so we haven't felt any pushback. As dispensaries close, we've even seen an uptick as patients come to companies like us to cultivate their own medicine. At the end of the day, patients who are going to consume are going to consume. There's demand for the product, whether it's a white market, black market or gray market. Are you motivated by personal as well as professional reasons? I broke my neck five years ago in a surfing accident. I landed head first on a sandbar, and in the hospital, they put me on this painkiller. You feel unbelievable when you're on it, but it's the worst withdrawal ever. I started utilizing cannabis, not only in smokable form, but in creams for my back. So I'm a huge proponent from understanding firsthand its efficacy and lack of side effects. I find it frustrating, as an entrepreneur, when the economy is in the state it's in, watching businesses creating full-time, well-paying, fully benefited jobs shut down by the feds. It's difficult for me to wrap my head around why it's not taxed, regulated and legalized. I don't understand why we're pushing it in the opposite direction right now. What's your vision for your company? To continue with M&A, expand our product lineups and integrate technology. We've made an environmental controller where farmers can control the cycle of cultivation, turn lights on and off, monitor CO2 levels, temperature and dehumidifiers from an iPhone or iPad. If they get a perfect crop, they can pull that data off the digital control and replicate it for the next crop. Increased technology can make indoor cannabis growing more environmentally friendly as well as add value to agriculture, given the droughts and our fragmented food distribution system. You want to change the industry with innovative technology that could also have mainstream applications that change the way we live. So you're kind of like the Steve Jobs of weed? 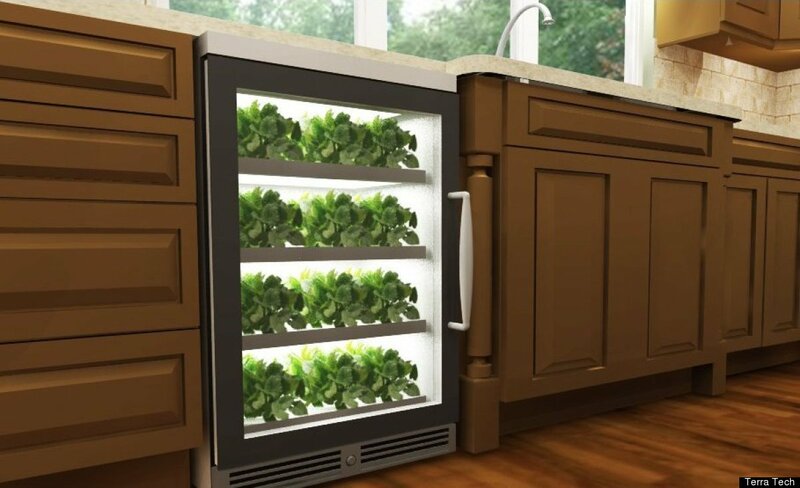 Company: GrowOp Technology, merged into Terra Tech Corp.
Later this year, Terra Teach is launching the "herbNgarden," an under-counter unit about the size of a dishwasher that aeroponically cultivates produce. It's fully automated so you set it like a dishwasher and simply add nutrients. Peterson called it "an appliance that actually pays [people] back."